After the early loss of his first wife, playwright Neil Simon married again soon afterwards. Six months after the death, he fell in love at first sight with actress Marsha Mason, and they were married after a romance of only twenty-two days. Simon transformed those events of 1973 into an autobiographical play that opened in 1977, and now this film stars Mason in a role that is based, we guess, more or less upon herself. Simon says the story isn't an actual record of what happened, but was just loosely inspired by his remarriage. There is no way for us to know. What we can say, on the basis of “Chapter Two,” is that if the key dialogue between husband and new wife wasn't taken from life, it is possibly taken from that wonderful category of what they should have said. And there is a great deal that they should have said. Simon is usually the most quick-footed and -witted of dialogue writers, but this time he gives us more than two hours of discussions, arguments, debates, reconciliations, and accusations that quickly become tedious. The conversations in his screenplay are too long and too literal to begin with, but they suffer from two additional handicaps: (a)They do not take place between two characters whose motives have been well established, and (b)they have the misfortune to involve James Caan, who is so tense, uptight, and verbally constipated that it's a trial to wait out his speeches. Caan plays the Simon-like character, a writer and new widower who is inconsolable in his grief until Mason happens along. Caan has previously survived a series of blind dates with the usual assortment of hopeless choices, and so Mason enchants him: She's outspoken, direct, spunky. Their first "trial date" lasts five minutes (one of those standard Hollywood "meet cutes"), and in no time at all they're in Bermuda on their honeymoon. So far, not so bad. This is all the stuff of dependable romantic comedy, and we know where we stand. But we are about to find ourselves at sea for the rest of the movie, because the Caan character suddenly has agonizing second thoughts ... his new bride gets on his nerves ... he doesn't know what's bugging him .. he's hurtful ... he splits. The movie never really bothers itself with why he behaves this way, unless we're supposed to supply our own instant Freudian analysis. Caan is awkward all through this movie (he never seems happy playing this part), but he's never more lost than when he undergoes this dramatic character transformation. And you can't really blame him: Simon just hasn't given him the words or actions to make himself clear. After the split, the rest of the movie is devoted to attempts by first one and then the other of the newlyweds to figure out what went wrong. Their scenes are so tediously top-heavy with dialogue that we can barely stand to listen. And then there's the added distraction of a parallel plot involving an affair between their best friends (Valerie Harper and Joe Bologna). There is absolutely no rational reason why this subplot is in the movie. Maybe it made sense in the mechanics of the stage play, but it doesn't belong here. And it's all themore distracting because, whatdaya know, Bologna and Harper are much better than Caan and Mason at conjuring up the romantic and comic juices of a love affair. Their scenes are meaningless and unnecessary, but at least they're alive, and just when they get their emotional rhythm flowing, the movie cuts back to the nonstop marriage counseling session that occupies the main plot. 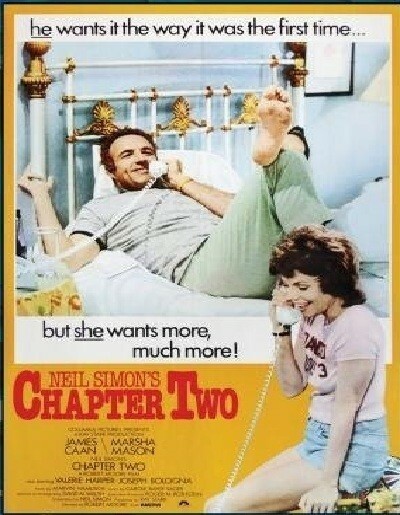 “Chapter Two” is called a comedy, maybe because that's what we expect from Neil Simon. It's not, although it has that comic subplot. It's a middlebrow, painfully earnest, overwritten exercise in pop sociology. I'm not exactly happy describing Neil Simon's semi-real-life in those terms, but then those are the terms in which he's chosen to present it. My notion is that Simon would have been wiser to imagine himself writing about another couple, and writing for another actress than his own wife; that way maybe he wouldn't have felt it so necessary to let both sides have the last word.